Launched in March of this year, Arm & Hammer introduced the Truly Radiant line of oral care products that are designed to help consumers achieve maximum whitening, cleaning and strengthening for a radiant smile. The Truly Radiant Collection includes Arm & Hammer Toothpaste, Extra White and Deep Clean Spinbrush battery-powered toothbrushes and replacement brush heads. Arm & Hammer Truly Radiant Toothpaste is designed to whiten, cleanse and strengthen teeth for a radiant smile in just five days. We saw results after just one usage, which is definite happiness. The only “issue” to note is that Truly Radiant Toothpaste ($3.50) does have a bit of a baking soda taste, which didn’t bother us but may be a bit of a surprise for some users. We used Arm & Hammer Truly Radiant toothpaste is conjunction with Spinbrush Truly Radiant Extra White Toothbrush ($9.99) and found that this spinbrush was of fairly decent quality, with easy navigation to those super hard to reach place and left our teeth truly clean. We were pleased with our Arm & Hammer Truly Radiant experience and the price point is perfect. Less then $14 for a brighter smile works for us! Actress Alison Sweeney was tapped as the face of Truly Radiant and Alison offers up a few amazing tips for bringing out your overall radiance, which you can check out at Live Radiantly. 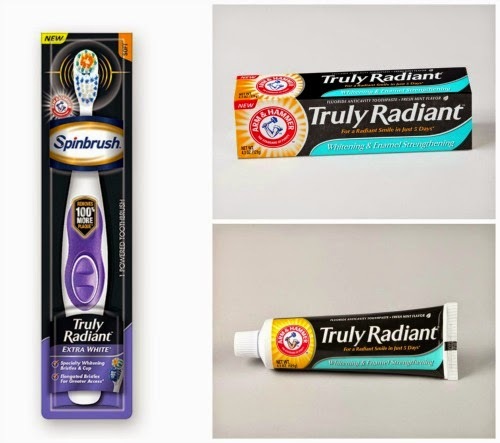 Arm & Hammer Truly Radiant is available at retailers nationwide and as an awesome “Back To School” you can find coupons for Arm & Hammer Truly Radiant Toothpaste HERE and Truly Radiant Spinbrush Toothbrushes HERE!